WW2 - The Second World War: Sergeant (Pilot) Thomas Fee, R.A.F.V.R. Thomas (Tom) Fee was born at Whitehaven, Cumberland (now Cumbria) in 1911 but spent many of his formative years growing up in North America (USA and Canada). After returning to his hometown of Whitehaven he initially worked as a builder. From this beginning he started his own building and contracting business which had a good reputation. On 27 July 1931, at 20 years of age, Tom Fee married Miss Mabel Dawson (aged 21) at St Nicholas' Parish Church, Whitehaven (Church of England). To begin with their family home was at 2 Lonsdale Street, Bransty, Whitehaven, later moving closer to the town centre at 4 Duke Street, Whitehaven. Tom and Mabel had two daughters, Jean (born 30 June 1934) and Dorothy (born 4 April 1942). Both children were baptised at St Nicholas' Parish Church. 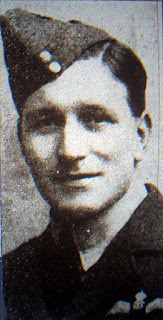 According to Tom Fee's obituary in 'The Whitehaven News' (Thursday 22 April 1943) Tom Fee was a Freemason. He was a member of two lodges - the Sun, Square and Compass Lodge and Henry Lodge of Mark. (b) Tom Fee's time in the R.A.F.V.R. According to an official form submitted to Whitehaven Borough Council in 1947 by Mrs Mabel Fee, her husband enlisted to the R.A.F.V.R. in August 1941. Much of his flying training had taken place in the USA (California). 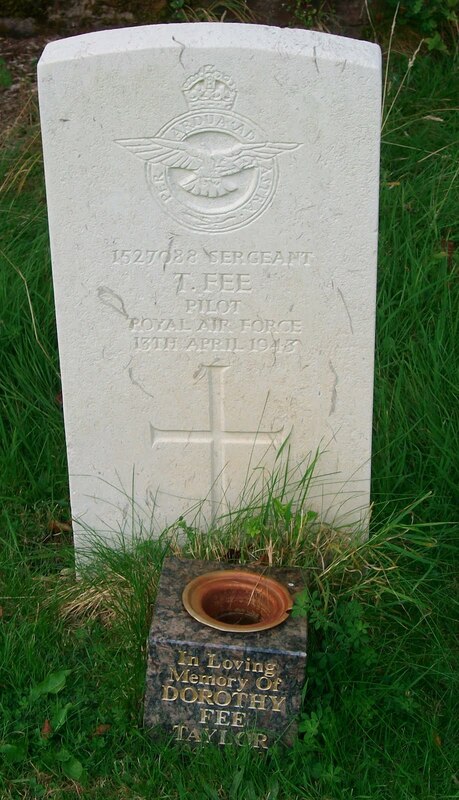 On returning from America Sergeant Fee was posted to Bomber Command's 101 Squadron (No 1 Group). In early 1943 101 Squadron was based at RAF Holme Spalding, East Yorkshire. Sergeant Fee was only able to obtain two short home leaves after returning from California. However, at the time of his death (13 April 1943) plans had been made for Sergeant Fee to be released from duty for a short time and attend Whitehaven's "Wings For Victory Week" to address audiences about operational flying. Sadly, this would never happen. His next, and final, return to his hometown would be for his funeral. On Tuesday 13 April 1943 the Lancaster bomber Tom Fee was piloting developed engine trouble shortly after take-off and crashed. Tom Fee and his other six crew members were all killed. The families were informed of the deaths the following day (Wednesday 14 April). According to Sergeant Fee's obituary in the local newspaper the letters of condolence received by Mrs Fee included one from his commanding officer and some from relatives of Sergeant Fee's crew who had been killed in the same crash. Grave/Memorial Reference: Ward 5. Sec. J. Grave 50. Sergeant Tom Fee's funeral service took place at St Nicholas' Church, Whitehaven on Saturday 17 April 1943 - the same church where he had been married almost 12 years earlier. The service was conducted by the Reverend Charles E. Nurse. There was a large congregation, including some of Tom Fee's RAF colleagues from his base and over 40 floral tributes were received. The bearers of Tom Fee's coffin were fellow Masons from the lodges he belonged to. 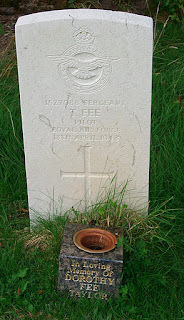 Afterwards, Tom Fee was laid to rest at Whitehaven Cemetery (Grave Ref. : 5 / J / 50). Fee - In loving memory of my dear husband, Sergeant / Pilot Tom Fee, who gave his life on April 13, 1943. Always remembered by Mabel, Jean and Dorothy." Tom Fee is also commemorated in the WW2 Borough of Whitehaven 'Book of Remembrance' and on the St Nicholas' Church WW2 War Memorial. Additional information: Son of Ernest Albert and Elizabeth Sophia, of Greenford, Middlesex. Grave/Memorial Reference: Sec. A. Grave 37. Grave/Memorial Reference: Sec. H. Uncons. Grave 282. Husband of Margaret Brough, of Dunfermline. Grave/Memorial Reference: Eastern Division. Grave 4077. Husband of Marjorie Leonora Smith, of Chorley. Grave/Memorial Reference: Sec. E. E.C. Grave 996. Additional information: Son of George Thomas Davison and Minnie Davison, of Stockwell. Grave/Memorial Reference: Block 12. Grave 704. Screen Wall. Panel 2. Husband of Ada Ann Beatson, of Hackenthorpe, Sheffield. Grave/Memorial Reference: Sec. A. (Gen.). Grave 953. An article by one of the BBC "People's War" WW2 Site Helpers, Tom Forbes, mentions that his grandfather (also known as Tom Forbes) was a close pal of Tom Fee during the war. The two 'Toms' had spent a lot of time together while training in California. The following link is to a page on the website of the BBC "People's War" helper Tom Forbes specifically dedicated to Sergeant Tom Fee. It has a number of photographs of Tom Fee, some with his family. "Loved in life, mourned in silence"